Rachael Sage + Friends - A Benefit For Orlando with special guests Seth Glier, Matt Nakoa & Michelle Citrin will take place at NYC’s Rockwood Music Hall Stage 3 on August 2nd, 8:15pm and will benefit The GLBT Community Center of Central Florida. In the wake of the tragic events in Orlando this past June, independent record label MPress Records and flagship artist Rachael Sage wanted to do something to help the families of the victims and the LGBT community. The New York-based label has organized a special fundraising event: Rachael Sage + Friends – A Benefit For Orlando, to benefit The GLBT Community Center of Central Florida. The event will take place at Rockwood Music Hall Stage 3 (185 Orchard Street) on Tuesday, August 2nd at 8:15pm. Sage will be joined by special guests Grammy® nominee Seth Glier, along with Brooklyn-based artists Matt Nakoa and Michelle Citrin. Sage, who is an active member of the LGBT community and has performed at Pride Festivals from London to San Francisco, was horrified by the attack on the Pulse Nightclub and immediately wanted to show solidarity. “Like so many of my peers, I was overwhelmed with sadness when the news hit and of course knew that we had to do something.” Within days, Sage had penned a poignant song “Disarm Distrust”, which she will debut at the benefit; the track will also be available on Bandcamp for a pay-what-you-want donation. 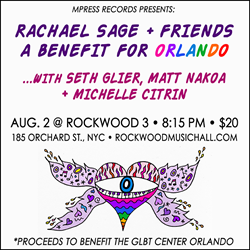 EVENT NOTES: MPress Records Presents: Rachael Sage + Friends - A Benefit For Orlando with special guests Seth Glier, Matt Nakoa & Michelle Citrin.